With Spring officially being here, I have been spending quite a bit of time cleaning the house and trying to redecorate. To me, the hardest part of cleaning is finding appropriate cleaners that don’t contain frightening ingredients, and are safe enough that they won’t make any of our animals sick. One of my major goals this year is trying to learn to make as many of our cleaners as I can to save us money. As I was looking at cleaning recipes, I was approached to review Becky Rapinchuk’s (Clean Mama.net) latest book – The Organically Clean Home. Curious to see some of the recipes inside, I couldn’t wait for this book to arrive! Tired of paying for expensive green cleaning products? If so, we think you will love The Organically Clean Home. This brand new book features 150 easy to make recipes using all natural ingredients you can easily find in your own home, or in your local stores. Best of all, they are inexpensive, allowing you to make exactly what you need for only a fraction of the cost of the cleaners you buy in stores. With amazing recipes from dishwasher detergent to antibacterial wipes, you can find the perfect cleaner for any situation just by following these easy recipes designed by Becky Rapinchuk! After trying these recipes you may never need to buy nasty store cleaners again! As someone who loves green cleaners and making my own cleaning supplies, I loved the Organically Clean Home. This book is truly a wealth of information, giving you detailed instructions and recipes to clean up just about any type of mess. To my surprise there are even recipes for making your own homemade stove cleaner and a safe cleaner for cleaning your fine silver. Really, this book is a must for anyone who is wanting to clean their home using only safe, natural cleaners. 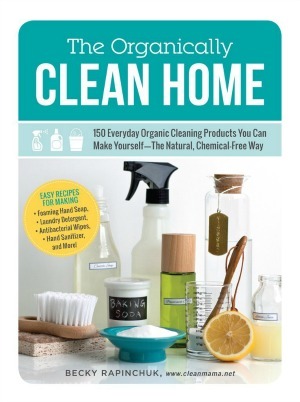 Based on my own experience with this book, I am happy to give The Organically Clean Home an A rating. Would you like to purchase copy of this book for yourself? You can purchase a copy of The Organically Clean Home for $11.99 or you can purchase the Kindle version for $9.99. I too have been making my own organic cleaners. I got most of my recipes off of Pinterest. But it is nice to have a book that has everything you need to know all in one place. vinagar is my go to cleaner. We have been washing windows with vinegar and newspaper and doing quite a few household jobs with resourceful, practical and natural things before we even knew what being “green” was. My grandmother used lemons for everything ~ They are an amazing creation. I don’t mean to sound like we know it all–what I know is what works and what I also know is that I’m sure I could learn a lot from this book. This sounds like a really good book to have, thank you for your review. I love natural and cleaning with natural ingredients is the best way to go, Im always looking for natural ways of doing things, cleaning included! I think this book is something that people has been wanting for a while- recipes for cleaners you make yourself that are not harmful to the environment! Sounds great!